The second year of annual MOT training and assessment (2017 to 2018) closed in March. It’s great to see most of you completed it and recorded your results in time - thank you to everyone who did this. But, some testers either didn’t complete the training in time or forgot to record their results before the March deadline which meant they were suspended from testing. To put these testers back on the system again our staff had to carry out important checks to verify their assessment certificates. This is a long process and it meant some testers were having to wait more than a week to be switched back on. Also, testers who had missed the deadline had to complete the training and assessment, and record their score, and then had to wait a considerable length of time to get a demonstration test. They needed to do this to get switched back on. I know this can be frustrating to you and your business, so I wanted to give you some tips in this blog post to make sure this doesn’t happen to you. I also wanted to let you know what the training topics for this year will be. We chose the topics for this year’s assessment based on what we think testers need to become familiar. Some of you also told us you’d like to know more about testing electric and hybrid vehicles, so this is something we included too. The additional topic for group B will be testing vehicles with alternative propulsion systems, such as hybrids and electric vehicles. The pass mark will stay at 70% and from this year, and you’ll also need to add your user ID and your date of birth into the MOT testing service. You can use the template to record your training, or you can make your own. 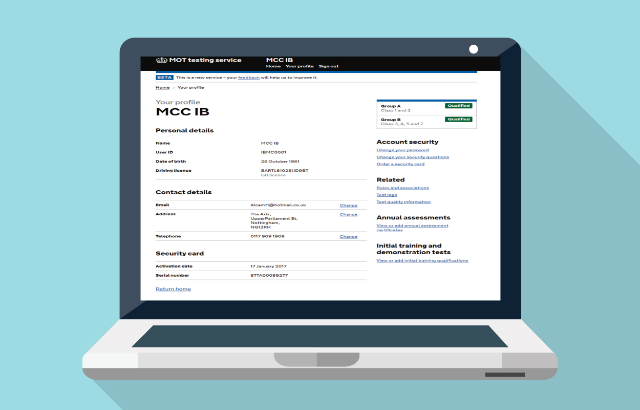 If you complete your annual assessment with either the Institute of the Motor Industry (IMI) or ABC Awards, your result will automatically upload into your MOT testing service profile. You won't need to do it manually. This is a great way to make sure you don’t miss uploading your result in time for the deadline. To do this, you need to include your date of birth and your MOT testing service user ID when you complete your assessment. If you don’t put in these details, we cannot verify your identity and your result won’t upload automatically. You won’t be able to do your testing on time if you’ve lost your status to test. To keep this status, you’ll need to carry out a test once every 6 months. The MOT testing service records the status of testers so you don’t need to tell us. However, if your status to test has lapsed, you’ll need to follow the process to return to MOT testing. We know that fitting your training and assessment studying into your working week can be quite a challenge, but the earlier you can do this, the better. Because the close of last year’s annual assessment coincided with the Easter bank holiday, some testers’ annual assessment results were not uploaded in time to meet the cut-off date even though they had done it in time. This year, Easter won’t fall on the cut-off date so you shouldn’t find yourself in this situation again. I hope this blog post has reminded you of some good practice tips to make sure you get your training and assessment completed on time. If you’ve got any other good ways of remembering to complete your assessment on time, please share them in the comments. Good luck! This will be my last blog post as I am retiring. Thank you for your comments over the years, which really help us to make the service better. Simon Smith will be taking over my role and will be answering your comments. But no where does it mention MISSING. So a tow bar fitted but no electrics is ok or a manual advisory at best. If it is 'missing' it is NOT functioning incorrectly, or not at all. It is simply missing, this is not in the manual so you cant fail. The reason you would fail if electrics aint working corectly is that customer propbably wont be aware and will be towing a trailer with no or little lights. But if electric socket is missing then the customer wont be hooking up a trailer, or if they do they are doing it knowing there is no electrics, so its on them. You could manual advise if its missing, incase after you mot it customer decides to wire some electrics in, and say they do it wrong, then advise not fitted to cover yourself . I thought we were getting 2 topics each year? Just knew You'd start throwing in additional items making us work our socks off at HOME for no extra pay! Bring back the old refresher courses and while your at it re-write the manual as if the old one had a few grey areas this ones is full of them..
Where on the tester system does it explain data protection for yourself and your customers? Ive looked via your link but it takes me to the main users guide page and i cannot find the appropriate sections? TMPS issue This has been mentioned several times on the matters of testing forums but still had no logical answer. From the manual as follows The TPMS warning lamp (see diagram 3) can operate in many ways depending on the vehicle type. You must only reject vehicles if it's clear that the lamp indicates a system malfunction and not simply indicating that one or more of the tyre pressures is low .It says we must only reject if it indicates a fault but when we are logged into the the system we cant fail it for a malfunction as its only listed as a minor defect the three options are .System inoperative = major .Indicates a fault= minor defect .lamp not working =advisory .What is inoperative the only way we could determine this maybe is if the light didn't come on but that is listed only as an advisory .The tpms section needs rewording to make it clearer. Can i ask a question please im ex dvsa doing mot.s in the new test items reason for rejection ie fail internal manual light adjuster not working im failing them as per book however the presenters are returning with the switch taken out hole blocked off where switch was wiring talen off lights as well for retest im having to then pass and advise as manual says nothing about what to do in this situation very frustrating waisting a part test slot for this just seems to me it.s making a mockery of the test i asked a customer where this ides came from he said it.s banding about on some forumn he heard about can somebody at dvsa please elaborate on this or put some guidance in manual as to what we should do iv had several now thanks in advance for you reply. Theres a few more loop holes that need shutting too. Like airbag lights dont fail if covered up..Surely something as high risk as this should have a compulsory illumination process? the switch it can no longer not work, the same as many other items on not tested.. Exhaust, seatbelts, airbag light, seats, headlamps, headlamp washers and probably many more. If little changes are being made to the manual with out officially notifying us, it would be helpfull if (like the old manual) there was someway of indicating something has been changed. eg a big bold line next to what has been changed. The manual & the way things are worded aren't going to be winning The Crystal Mark award anytime soon ! Copied from the manual, DVSA whats the difference between malfunctioning and obviously inoperative? Surely its working or it aint?? The minor defect would suggest the tyre is obviously under inflated and the tester would consider that the TPMS warning should have been illuminated. With the major defect, the lamp will generally illuminate and go off again when the ignition is switched on. In the event of a system malfunction the lamp will flash a number of times and then remain on. Yeah i understand that but without reading your reply its not clear because you have malfunctioning as an advise and inoperative as a fail. Why not simplify this and remove malfunctioning from advise, just leave it as tyre obv low pressure?? I have come across this issue and unfortunately your reply dosent completely answer the question. The manual dosent tie in with what we see when we have a vehicle logged on. We get three choices as follows. Tyre pressure monitoring system inoperative. Major fail. Tyre pressure monitoring warning lamp indicates a fault. Minor defect. Lamp does not illuminate. Advisory. So the system malfunction as you said will flash when the ignition is turned on then stay on this idicates a fault but we cant fail it because it only a minor defect. The light not coming on at all is only an advisory so how can we tell if the system is inoperative. In regards to centre stop lights, the new manual is worded different to the old. You must inspect all stop lamps fitted. Additional stop lamps, over and above the mandatory requirements, must be tested. However, if you aren't sure if they are connected, you should give the benefit of the doubt. If you look in the manual, 4.3.2 paragraph two will answer your question. vehicles first used on or after 1 January 1971 must have two stop lamps.